No holiday in Kolkata is complete without a last minute souvenir dash around New Market. I was lost. In a beige linen "frock". With sales staff yelling "shishter, shishter!!" after me. Normally I would declare: "I am not your sister." Post seven weeks of non-stop quality food? I am in Zen Zone. "No, I don't need an embellished, polyester loin cloth" I manage. With a smile. In Bengali. At which point they realise I am Indian, grunt with disgust at my wannabee look and find some real gora to heckle. So I am back from the land of Avian Influenza. Chicken is strictly off the menu there. And so are eggs, obviously. Which has left all Bengalis (mother included), baffled about how to bind their beloved chops. Word Health crisis aside, It has been a fantastic break. Most notable in my protruding one-pack and 4000 photographs. But also in a whole new collection of recipes. So here's the first. 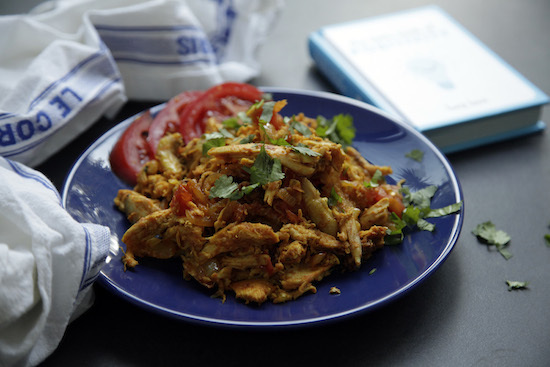 My ode to the humble bird: chicken bharta, a highly-moreish shredded chicken curry. This dish is a staple at lazy Kolkata lunches under whirring fans at part sports complex, part social hub and complete remnant of the Raj - The Saturday Club. Cook this. Eat it. Dream of your next extended break. Just like I will. In a shallow frying pan, bring the oil to heat over a high flame. Soak the kasoori methi in a tablespoon of hot water. When hot add the bay leaf and, as it sizzles up, the onion, ginger and garlic. Fry them for about five minutes until they turn a pale golden brown in colour. Next add all the powders, apart from the methi. Fry the whole lot for about two minutes and then toss in the chicken. Mix the ingredients well. Lower the flame to a medium heat, add enough water to submerge the onion mixture and cover the pan. Stir the chicken from time to time for about 20 minutes. At the end of time, stir in the tomato pieces. Now you need to turn the chicken pieces into bharta or mash. Just take each piece onto a plate and with two forks shred it, discarding the bone. You can also just use leftover roast chicken, and add it when you are tossing in the tomatoes. If the chicken is cooked well, the meat should just fall off. If it doesn’t, just stick it back in the pan and cook for longer. To finish, stir the shredded chicken back into the frying pan along with the watery kasoori methi and some salt. The dish should be moist but without a curry. Garnish with a quartered boiled egg and the fresh coriander. This Chicken Bharta superb with just about anything. But my special recommendation would be team this with pitta bread or some readymade naan for a super simple and satisfying supper. Sounds like you had a great trip! Thanks for this great new recipe. Our kitchen is undergoing a remodel right now, but when it’s finished I’ll be trying this out! My throat closes up whenever I am in B’lore bcos of the pollution, so I do understand. Yey, you’re back! The cooking can resume! blog-world missed you around here, welcome back! the picture and recipe look tasty. Officially on my to-do list. Hey, you’re back! GREAT! Look forward to your stories and tasty morsels! Love any chicken dish! Zen chicken looks toooooo yummy !! I’m gonna try tat out soon. Thnx for sharing..
LOVELY to have you back Mallika. I’ve missed my regular dose of QIC. Welcome back! Sounds like a great trip! Have missed your blog updates whilst you’ve been away! Welcome back! Glad you had a good trip and your dish looks wonderful! “Word Health crisis aside, It has been a fantastic break. ” That could be the blog quote of the year! Great to have you back. Are you planning on sharing any of those 4000 photographs? When do we add the roughly chopped tomato? Hi Puja – after the chicken goes in. It’s in the fourth para. Good luck! I have just discovered your website and all of your recipes and want to say THANKS 😉 bloody good stuff. Theres a little bit of a discrpency in the recipe provided here. Under the ingredients it says to use skinless, boneless chicken but under the method you have mentioned to shred the chicken with two forks till it ‘falls of the bone’ as well as “If the chicken is cooked well, the meat should just fall off”.